Because it reduces the blue light you get a much warmer color temperature making the screen lean more toward the red, orange and yellow spectrum. 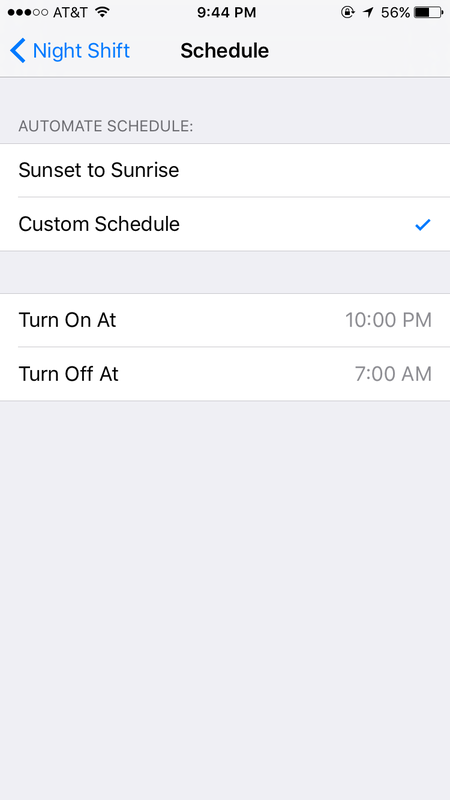 Night Shift can be scheduled to turn on/off at specific times you set or, if you want to get really crazy, you can use the ‘Sunset to Sunrise’ option. 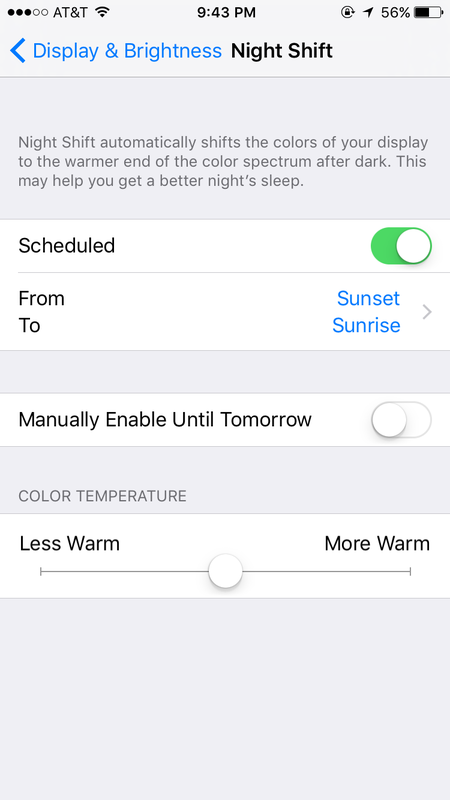 This option, “uses your iOS device’s clock and geolocation to determine when it’s sunset in your location, then it automatically shifts the colors in your display to the warmer end of the spectrum. In the morning, it returns the display to its regular settings.” It’s pretty sweet. Now, I have been using Night Shift for a couple weeks, and I will say that there are times when I just prefer to have it off during the ‘Sunset to Sunrise’ time when it has already automatically turned on. This is usually when I’m editing a photo and trying to pick a filter or when I’m taking a photo. 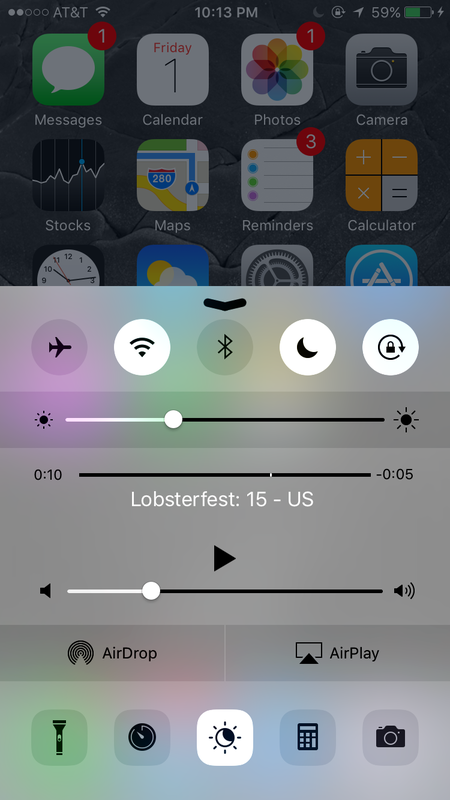 In that case, Apple made it very easy to toggle Night Shift on/off. If you swipe up on your device and bring up the Control Center there is a new icon that looks like a sun and moon. That is the Night Shift mode toggle. So, for those times when I do prefer to have it off, I can quickly turn it off and then turn it back on when I’m done editing. Not going to lie, I’m not sure the new Night Shift feature actually helps me to fall asleep faster or any of that jazz, but it does have a nice, warm feel to it. I suppose that is appropriate for evening and early morning! 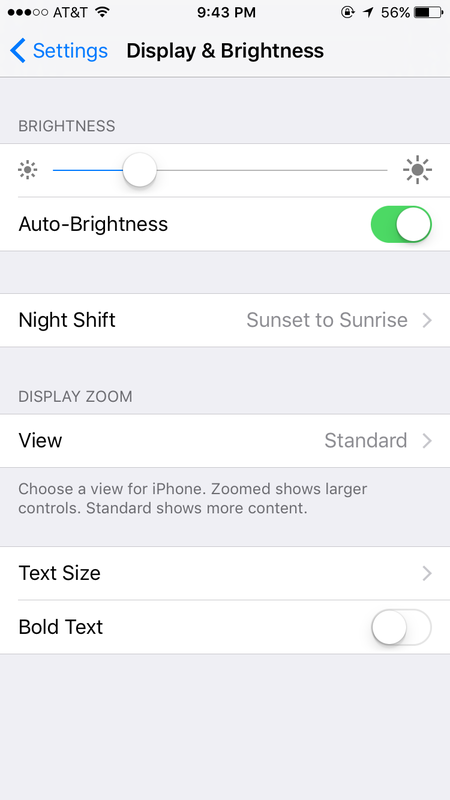 To enable Night Shift mode you can go into Settings > Display & Brightness > Night Shift. Here you will find options for setting the time for the mode and the ability to adjust the color temperature of the mode. This mode will work on the; iPhone 5s or later, iPad Pro, iPad Air or later, iPad mini 2 or later and iPod touch 6th gen.